The Nady UHF-4 Handheld Wireless System offers offers high-quality wireless at an amazingly affordable price. Here's live sound wireless with interference-free operation on select UHF frequencies; companding circuitry for a 120dB dynamic range; and clear, natural sound. A Nady DigiTRU Diversity dual-antenna system prevents dropouts and extends range. Tone Squelch blocks potential interference. The Nady UHF-4 wireless system's full LED indicators keep you on top of things. Nady includes unbalanced 1/4" and unbalanced XLR outputs and silent transmitter on/off. 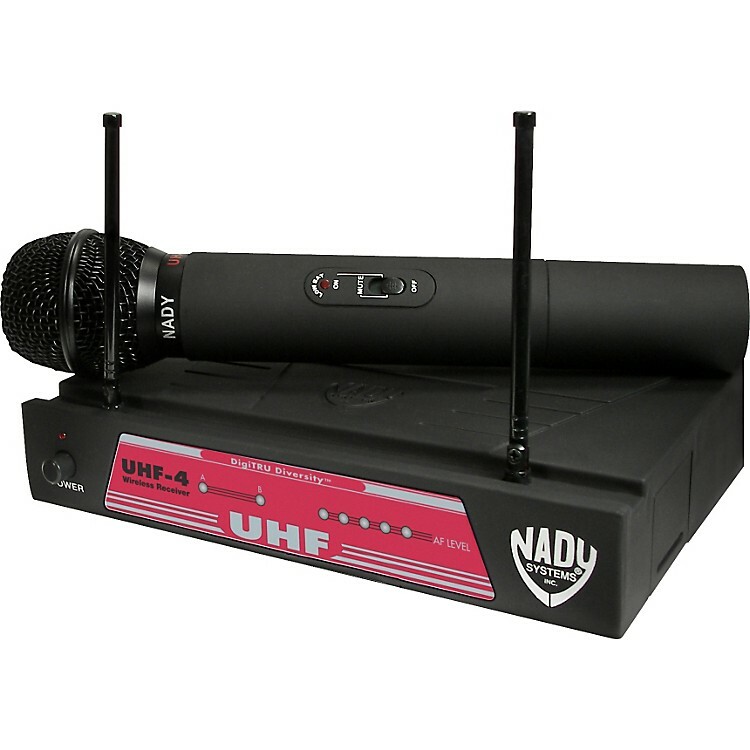 The Nady UHF-4 wireless system includes a receiver and a hand-held microphone transmitter. The microphone has a Nady DM-10D unidirectional neodymium dynamic cartridge for true sound, maximum feedback rejection, and minimal handling noise. The transmitter offers status and low-battery indication and an off/standby/on switch. A 9V alkaline or NiMH battery provides 4-6 hours of continuous usage. Order now and have wireless you can depend on. UHF-4 Hand-held: 9-1/2" x 2"